The nimble Bosmer are strongly suited for thief characters and archers. Their talent for alchemy allows them to make poisons to help their archery even more and to create potions that could help their thievery. In combat, Bosmer are heavily focused on archery, in which they are generally understood to be the single best among the Tamriel races. They start out with a nice bonus in Archery and are well-suited to use it. They are good in sneaking, so they can often get a sneak attack bonus. Particularly in the early levels, the animal ally ability can be somewhat useful. Low combat skills can render some creatures (particularly bears) extremely dangerous to low level characters, especially melee focused players. This ability also overrides a Spriggan's ability to control animals, which can potentially turn a fight in the player's favor. Additionally, having an animal to distract dragons early on can be particularly helpful. It's worth noting, however, that the situational nature of this attribute coupled with its redundancy anywhere beyond the mid levels makes it one of the weaker bonuses available. 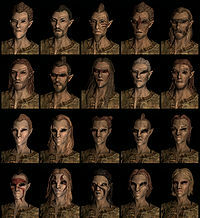 There are no male or female Bosmer characters whom the player can marry. Esta página foi modificada pela última vez à(s) 21h38min de 7 de agosto de 2015.